If the popular immunosuppressant Humira was a standalone company, it would be twice as big as the Hilton hotel chain and its sales would rival Southwest Airlines and Visa. How is this one drug so profitable? After rebates, the average price of the drug is $3,000 a month. The company that sells it, AbbVie, has made 115 billion in profit off the drug since 2010, and more than half of those profits come from the U.S.
Insulin, a drug whose patent was created almost a century ago, is skyrocketing in price. Diabetics around the country are forced to choose between rationing life-saving medication, falling behind on rent and car payments, or going without food. The original developers of these drugs wanted their scientific innovation to serve the public good—so what gives? 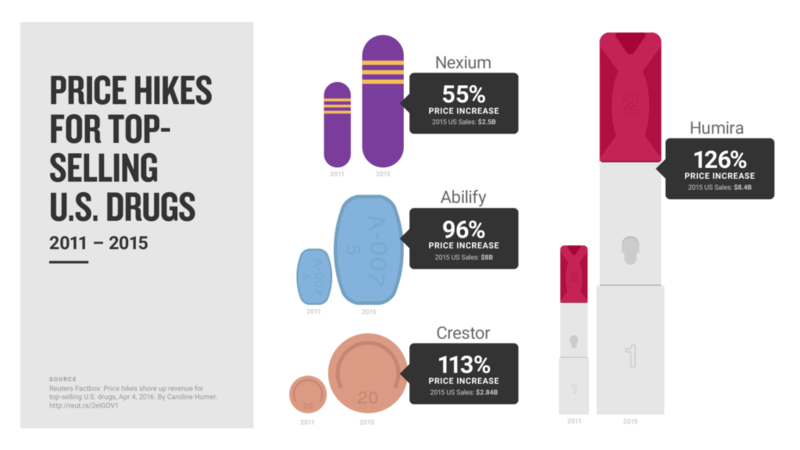 In the status quo, there’s no incentive to sell drugs at a reasonable rate. Pharmaceutical companies can claim that in order to recoup the costs of research and development, they must have exclusive access to the market for their specific drug. While they have market exclusivity, the drug company is then able to gouge the price of their drug. There is no competitor to incentivize lower costs. There’s also no government scrutiny as to why the price is what it is. We don’t know why certain pharmaceutical drugs are priced the way they are. Therefore, we have no control if those prices start rising exponentially, and patients have no way of affording the only drug available to cure their condition. What is one supposed to do if they have breast cancer, Hepatitis C, or multiple sclerosis and can’t afford their drugs? We use public dollars to fund research to prevent this exact problem. Public research money contributed to the 210 new drugs approved from 2010-2016, to the tune of $100 billion dollars. Unfortunately, drug makers have taken advantage of the public’s investment in research to strengthen their bottom line. These practices are an insidious betrayal of public trust and morally wrong. In the richest country in the world, people lose their lives because they can’t afford their medicine. It’s also peculiar that in a so-called free market, we allow monopolists to fully control markets without consequence. The pharmaceutical industry has gamed every rule set in place for them. It is past time for them to face the consequences for the system they have engineered. Many members of Congress shy away from drug pricing reforms, citing its complicated nature. Others believe the current injustices are based off a few bad actors, not a whole industry that puts profit over human lives. We can’t just point to the most shocking examples of price gouging that make headlines—we have to examine the system that encouraged drug companies to price hike in the first place. For far too long, the pharmaceutical industry has profited off a public too intimidated to scrutinize their business practices. By directing our attention to examples like “pharma bro” Martin Shkreli, the industry is absolved of any accountability for how they price drugs. This isn’t a case of a few bad actors. This is a system that thrives on taking advantage of the vulnerability and desperation of patients in need of life-saving drugs. The details of drug pricing reform are complex, but don’t let the pharmaceutical industry bamboozle us into thinking reform is unattainable. To give just one example, every other country in the world allows price negotiations. In the United States, the Department of Veteran’s Affairs negotiates drug prices for their patients. When put together, the proposals coming out of Congress are reasonable reforms. They allow Medicare to use its bargaining power to negotiate prices for its patients, penalize drug corporations that spike the price of a drug without justification, and prohibit abusive tactics used to delay a drug going generic. There is bipartisan support for doing something about the cost of prescription drugs. This is not an issue we can put off. Every day we refuse to engage and take action, another person risks their life to go without medicine they need to survive. A new poll reveals that 3 out of 10 adults report not taking their medicines as prescribed at some point in the past year because of the cost. Diabetics are risking their lives and rationing their insulin—in fact, 1 out of 4 diabetics admit to doing so. During our 2018 Nuns on the Bus Tour, we encountered the deadly consequences of this issue. In Savannah, we heard the story of Niema Ross, a young working mother of three who had died that weekend because she couldn’t afford the inhaler she needed to breathe. Niema’s final post on Facebook was a photo of her empty inhaler captioned with a message asking if anyone had access to more. The community tried to raise money for her medication, but it came too late. Niema was never able to get her inhaler, and now her three children will grow up without a mother. The drug industry’s success in putting profit over people over profit is perhaps one of the most blatant moral issues of our time, and Congress has the power to do something about it. Let’s remind our representatives that now is the time to be morally courageous and end the absurdity that is our prescription drug industry. Graphic courtesy of Voices for Affordable Health. 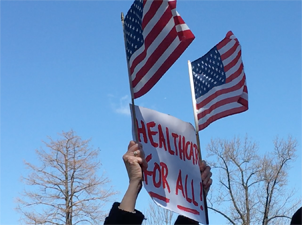 This entry was posted in Emerging Justice Seekers, Front Page, Healthcare, Mend the Gap on March 5, 2019 by siena. Last week NETWORK sent the following letter to all members of the House of Representatives urging them to support a bill introduced by Rep. Lloyd Doggett that would require pharmaceutical companies to negotiate prices with Medicare Part D. The bill now has over 100 cosponsors and is being evaluated in the House Ways and Means Committee Subcommittee on Health. 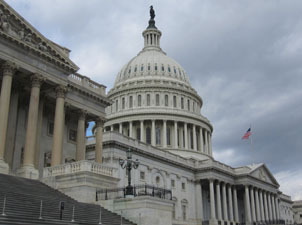 In the State of the Union, President Trump voiced his support for Congressional legislation to lower prescription drug prices, saying: “It is unacceptable that Americans pay vastly more than people in other countries for the exact same drugs… This is wrong, this is unfair, and together we will stop it.” Rep. Doggett’s Medicare Negotiation and Competitive Licensing Act is just the start of the House’s legislative action on drug pricing. 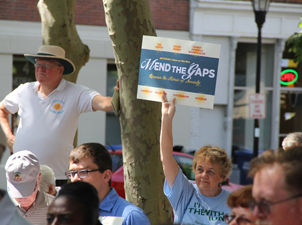 NETWORK will evaluate additional legislation and continue advocating for policies that mend the gaps in access to healthcare. Read the letter below or as a PDF here. 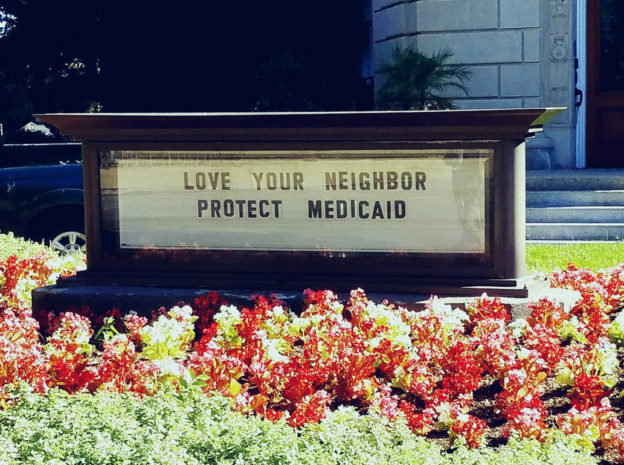 NETWORK Lobby for Catholic Social Justice urges members of Congress to become original cosponsors of the Medicare Negotiation and Competitive Licensing Act today. It is morally reprehensible that 1 in 4 Americans have difficulty paying for their prescriptions. Congress must take specific steps to remedy this wrong. Taking action to lower drug prices is the top domestic policy priority of Democrats and Republicans, and achieving lower prices for Medicare Part D through direct government negotiation with drug manufacturers is both popular and effective. This policy has support from more than 9-in-10 Americans across the political spectrum. The midterm election was clear—voters expect practical solutions that lower unreasonably high prescription drug prices. The Medicare Negotiation and Competitive Licensing Act is a common-sense reform that would allow Medicare to negotiate reasonable and affordable drug prices for seniors. By including a fallback to negotiations of competitive licensing when pharmaceutical companies fail to offer an appropriate price, seniors are protected from unfair prices, and Medicare patients will have continued access to the medication they need. Healthcare is a fundamental social good and essential human right. Inspired by Catholic Social Justice, we seek health care that is high-quality, accessible, affordable, and equitable. We know that unaffordable prescription drugs keep care out-of-reach for far too many people. Congress must take this concrete step to lower drug prices for patients to ensure no one has to go without their medication due to cost. We urge you to cosponsor this important legislation. This entry was posted in Front Page, Healthcare, Policy Update on February 13, 2019 by siena. There’s a silent but deadly epidemic occurring across the United States: women are dying during childbirth at an alarming rate. The United States is the only developed country where the maternal mortality rate is rising. Pregnancy-related deaths increased from 7.2 deaths per 100,000 live births in 1987 to a high of 17.8 deaths per 100,000 in 2009 and 2011. On top of that, 50,000 mothers a year experience dangerous complications that have the potential to kill them. U.S. women had a better chance of surviving their pregnancy thirty years ago than they do today. The fact women are worse off than thirty years ago is an embarrassment and a terrifying reality for women who are choosing to start families. If we truly care for one another, we must put a special focus on this critical issue impacting women across the country. The rising maternal mortality rate is a public health crisis that is receiving a woefully low amount of coverage and legislative responses. California is the only U.S. state that has successfully lowered their maternal mortality rate. From 2006 to 2013, the state cut its maternal death rate in half. This was accomplished by a thorough investigation of the care process, and an implementation of better practices. California hospitals work in a collaborative that shares information and best practices specifically about maternal care. In order for other states to replicate California’s success, Congress must act. Recently the House and the Senate passed the Preventing Maternal Deaths Act, which was introduced by Rep. Jaime Herrera-Beutler, with bipartisan support and a companion bill in the Senate introduced by Senator Heidi Heitkamp. It creates maternal mortality review committees in every state that gather data and report their findings back to the Department of Health and Human Services. The U.S. healthcare system denies far too many women the care they need before, during, and after giving birth, a fact that needs to be remedied through legislation. Due to the medical racism that permeates the healthcare system, women of color are frequently ignored by providers when they advocate for their medical needs. Black women are almost four times more likely to die of pregnancy-related causes, pointing to a shocking racial disparity. This is intensified in maternal health care deserts, where women lack access to critical healthcare. In rural and urban areas with limited OB-GYN services, women of color suffer greatly. In her congressional testimony, Stacey Stewart, the president of the women’s health nonprofit March of Dimes, emphasized that women of color often feel less trusted and feel less listened to in the medical system. She pointed to the fact that there are no obstetrical services east of the river in Washington, D.C.’s predominantly Black neighborhoods—women must cross the river to receive any sort of prenatal care. She also observed that in New York City, women of color are 12 times more likely to die as a result of pregnancy than white women. Women of color are disproportionately vulnerable to deadly pregnancy complications, making the maternal mortality crisis a horrifying manifestation of racial injustice. In his testimony to the House Energy and Commerce health subcommittee in September, maternal healthcare advocate Charles Johnson told how he lost his wife Kira after she gave birth to their second child. Kira and Charles, a young Black couple, made sure that hospital staff were aware that Kira was bleeding heavily after her C-section. Yet the hospital waited ten hours to address her medical crisis. By the time hospital staff acted, it was too late. Kira died of massive internal bleeding, leaving behind an 11-hour-old child, her husband, and her other young child. Kira did everything right; she advocated for herself and her child throughout her time in the hospital. Despite Kira and her husband’s persistence, her symptoms were ignored until it was too late. The CDC Foundation estimates that 60 percent of American pregnancy- and childbirth-related deaths could be prevented. The U.S. healthcare system is focused on infant health while ignoring the holistic needs of women. As a result, healthcare providers are not equipped to protect pregnant women and prevent complications that can be easily addressed under the right care. We know many of these deaths can be avoided, but we must take action to examine how our healthcare system fails women and create policies that will prevent this. Congress has taken the first step passing the Preventing Maternal Deaths Act, which was only possible because of the continued advocacy of the public. Using this as a first step, it’s important to keep the momentum going to fight for even bigger reforms to make health care safer and more equitable. Health advocates need to make it clear to legislators that maternal health needs to be a key priority, both as we come to the end of the 115th Congress and in the new Congress. Far too many women, especially women of color, have needlessly died in this public health crisis. The only way to begin working toward a solution to this crisis is providing resources to gather more data on this epidemic so healthcare providers have the tools to prevent more tragic losses. This entry was posted in Emerging Justice Seekers, Front Page, Healthcare, Policy Update, Women and Families on December 17, 2018 by siena. In September 2018, the state of Arkansas revoked coverage for more than 4,300 Medicaid users. The state recently implemented a stringent work requirement on Medicaid recipients under the Arkansas Works program, stipulating that they must perform 80 hours of work, service, job training, or education a month. The state unceremoniously dropped recipients who did not properly log their hours into an online portal for three months. These dropped Medicaid users have no possibility of reapplying for the entirety of 2018. This news came as a shock to the many low-income Arkansans who previously qualified for Medicaid. Due to the low profile implementation of the program, many were not aware of the new requirements. Some will not even realize they have lost their healthcare coverage until they go to the doctor or try to fill a prescription. This is not an isolated phenomenon. Across the country, the Trump administration and its allies are encouraging burdensome work requirements for programs like Medicaid and SNAP (the Supplemental Nutritional Assistance Program). Indiana, New Hampshire, and Kentucky already received federal approval to implement their own Medicaid work requirements, while at least nine other states are considering them. Even if Medicaid recipients in Arkansas are aware of the recent changes, they might not be able to access the Arkansas Works website to log their hours. According to the Federal Elections Commission, about a fourth of Arkansas’s population lives in areas without Internet service. The online portal has also been fraught with problems, preventing many from logging their work hours. Curiously, the website is down for 10 hours every night for maintenance, leaving it out of commission for 70 hours a week. These barriers make compliance difficult for a population already stretched thin. It’s not as if Medicaid recipients aren’t working. At best, only 15% of enrollees not exempt from existing work requirements are not employed (Urban Institute); the vast majority are already working. The reason they are utilizing Medicaid is not due a lack of work—it is due to the deep poverty they are experiencing. Recipients do not have access to quality jobs that pay a living wage and provide health benefits. Let’s not be mistaken—programs like Medicaid already have strict work requirements. These additional work requirements are an attempt to burden vulnerable populations with administrative barriers to affordable, quality healthcare. By dropping more than four thousand people from Medicaid coverage, the state of Arkansas stands to save 30 million a year. States like Arkansas that choose to implement these cumbersome some work requirements are choosing savings over care for their people. Burdensome work requirements don’t address the realities of the low-income populations Medicaid serves. Work requirements don’t create stable jobs that pay a living wage, nor do they do anything to alleviate the racial income gap. Black Arkansans are twice as likely to live below poverty level than their white counterparts. These work requirements are complex in nature—they are designed to quietly dismantle social safety nets while stigmatizing low-income people as the problem. If Arkansas is serious about getting its residents off Medicaid, it needs to address economic inequality and reinvest in the working class. The data from Arkansas gives us a look at the true human cost of burdensome work requirements. As other states roll out similar programs, thousands of people will unknowingly lose their coverage. There is no human benefit to burdensome work requirements. They only serve to harm people who utilize programs like Medicaid and SNAP to survive. NETWORK opposes implementing work requirements on our most effective human needs programs, and urges lawmakers to craft these programs to uphold human dignity, not diminish it. This entry was posted in Front Page, Healthcare, Mend the Gap, Policy Update on October 2, 2018 by siena. This month has been particularly rough for the Affordable Care Act (ACA). In two acts of sabotage, the Centers for Medicare and Medicaid Services (CMS) announced policy decisions that will undermine access to health care for millions of people. (You can see our coverage of previous ACA sabotage from the Trump administration this year here). First, the administration and the Centers for Medicare and Medicaid Services sent out a notice that funding for the navigator program would be cut to $10 million for the 2018-2019 enrollment period. Navigators work on the ground to help people navigate the online Insurance Marketplace and choose a plan that is right for them. Most navigators work for non-profit companies, and are present in congregations, public libraries, and other spaces to meet the needs of their community. Navigators also provide internet access to low-income and elderly people who might not have access to a computer find affordable health insurance. In 2016, the program was funded at $62 million, and only $36 million last year. CMS also announced that it would be ending the risk adjustment program for insurance companies on the marketplace after a narrow ruling in New Mexico. The risk adjustment program is one of the main ways people with pre-existing and complex medical conditions can gain access to healthcare. The program uses premium money from healthy people in the individual market to pay for sicker people. It doesn’t cost anything, and is one of the main ways insurance works. Without this, however, costs could skyrocket for people with pre-existing conditions. This comes as rates and markets are being set for 2019, and without the ability to spread around risk between healthy and sick patients, premium rates could increase dramatically. However, this decision was based on one case in New Mexico, where the judge ruled that the program in the state could not continue. Previous to this, a judge in Massachusetts had found the rule legal. However, CMS decided that the New Mexico ruling applied to all twenty-three states that have their own individual marketplace programs. Additionally, the Centers for Medicare and Medicaid Services could have done a few things, including starting the appeals process or asking if the court meant for the ruling to apply to markets outside of New Mexico, that they chose not to do. The reduction in funding for the popular navigator program, combined with the ending of the risk adjustment program, are two more acts of sabotage against the Affordable Care Act. We are seeing time and again that what the administration cannot do through the legislative process, they are doing through the administrative one. This entry was posted in Front Page, Healthcare, Policy Update on July 27, 2018 by Kaitlin.